Disaster response nonprofit, the Field Innovation Team, brings attendees up close and in person to robots for good from March 15 - 17, 2015. What does a programmable, electricity-generating robot have to do with unaccompanied migrant youth from Guatemala, El Salvador, and Honduras? The answer is a Robotics Petting Zoo. In August 2014, the Field Innovation Team (FIT) brought its Robot Petting Zoo (RPZ) to the border immigration crisis as part of successful innovation programming focused on community-building and exponential thinking. 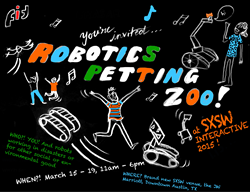 On March 15 – 17, 2015, the first ever SXSW Robot Petting Zoo is coming to the SWSX Interactive Festival, and is being organized by FIT. The zoo will include ground and aerial robots for SXSW attendees to touch, operate, and even program. The Field Innovation Team and robot handlers will explain how robots have been used to support in disasters, as well how they could be used to support crisis response and recovery in the future. Hugh Forrest, Director of the SXSW Interactive Festival, says, “We are super excited that the Robot Petting Zoo will be a part of the 2015 SXSW Interactive Festival. The presence of the RPZ should help raise awareness of how automated machines are assisting in various disaster relief efforts. And, it will raise this awareness in a SXSW kind of way -- which means lots of hands-on fun, excitement and engagement for all the registrants who stop by this area." Robotics Petting Zoo visitors will get to play with robots whose functions mimic those of humans and meet robots who have flown above disasters to gather critical data. Humans interested in Macgyver-esque robots will meet robots that can serve many purposes, such as flying while 3D printing. “FIT believes in the utility and necessity of using robots for ‘good’ and brought together this collection to demonstrate and re-think how robots can be used to help in crises,” says Desi Matel-Anderson, Founder and ‘Chief Wrangler’ of FIT. The Robot Petting Zoo was initially developed in the summer of 2014, when FIT deployed to St. Peter-St. Joseph Children’s Home in San Antonio, TX to bring new, innovative programming in support of the refugees cared for in the home’s International Program. FIT is a crisis response organization that also helps communities develop disaster risk reduction and preparedness programs. The Robotics Petting Zoo takes place at SXSW’s newest venue, the JW Marriott Sunday, March 15, 11am – 6pm; Monday, March 16, 11am – 6pm; and Tuesday, March 17, 11am – 4:30pm. For more information contact info(at)fieldinnovationteam(dot)org and visit the schedule here.